Hotel ibis Hamburg Alsterring. Book your hotel now! Wifi! The Hanseatic brick-style ibis Hotel Hamburg Alsterring is located in Wandsbek, a peaceful district of Hamburg. The Wandsbeker Chaussee U-Bahn (underground) and S-Bahn (city rail) station is just a few steps from the hotel, allowing you to reach the main train station, the landing bridges and many interesting sites in Hamburg in just a few minutes. The S-Bahn also takes you directly to the airport. The hotel has 150 air-conditioned, non-smoking rooms, free WIFI and a public garage. Just 15 mins on U-Bahn to the exhibition center and the harbor; 8 mins from main train station. 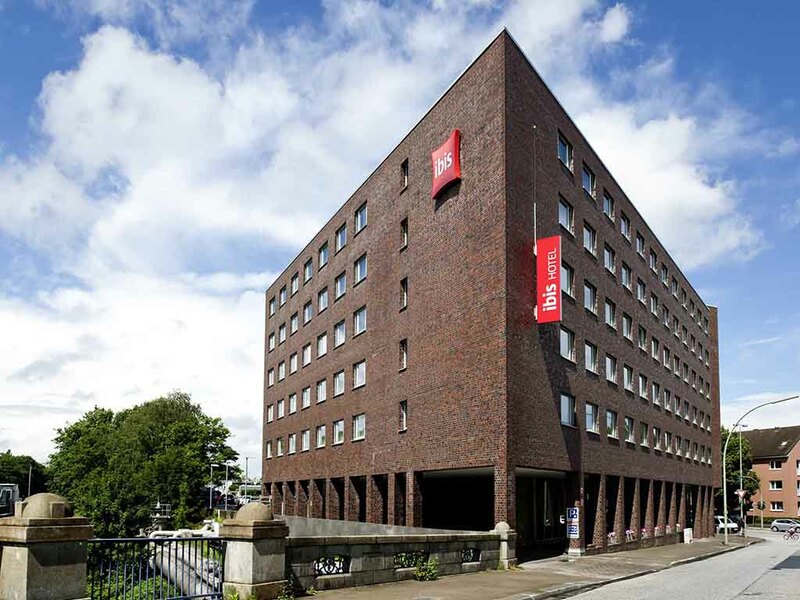 The ibis Hamburg Alsterring has 150 soundproofed rooms with a high level of comfort. Room amenities include air conditioning, innovative high-tech beds for the ultimate in comfort, free WIFI and a TV with a wide range of Sky channels. I stayed in railway track side room.Too much noise of train running sound whole night through the window.I could not able to sleep at all.I told these in reception to change the room.But they asked me to get the luggage before Noon.I had gone urgent meeting again same thing for next day as well.Weekend I managed and moved out. One staff was rude in communication.I thought may be it is way of communication and did not take serious. Excellent service. Very nice staff. Our stay was a delight. The staff was very friendly and always in a good mood. Breakfast was surprisingly good. One evening we came home hungry past 11 pm and decided to order some sandwiches, which we expected some lone receptionist would unwrap and throw in the microwave. Instead, we got delicious crispy sandwiches that looked fresh and just like in the menu. If we had to seriously nitpick: It would be nice to have power outlets right next to each side of the bed. It's 2019 so, at night you'll always have at least as many mobile phones being charged in each room as there are people sleeping in it. Please get a few dozen extension cords and your rooms will be perfect. The staff were friendly and helpful. Breakfast could have been better but very glad it was available. This was a short stay to visit Christmas Markets in the area. The hotel is ideal for public transport being a couple of minutes walk from the U-bahn and S-bahn stations. The main railway station is about 10 minutes away using the S-Bahn. The rooms were clean and quiet. There were plenty of shops and restaurants / takeaways in the local area. Good hotel with a nice atmosphere. Very friendly and helpful staff at the reception. It was good experience . Quality of bed , other facilities, cleanliness was good . But hand towels & small towels , disposal sanitary plastic bags was missing in toilets . We have stayed here a few times. Usual Ibis hotel with friendly staff, clean rooms and &quot;pod-type&quot; bathrooms. the parking is reasonably priced and secure; in fact, it can be difficult to escape from it! Good buffet breakfast and friendly bar in the evening. The only downside is the air conditioning in the rooms which is either &quot;full on&quot; or &quot;full off&quot;. But the train noise can be quiet calming if you leave the window open. Too short visit for big message. All was OK in hotel. Like this hotel as it is positioned near to train station to city center. Good parking at ok price. Ok restaurants nearby in walking distance. Quiet even though it is close to train station. Ok breakfast with good service.